As the last week of school approaches for many, stress reaches a peak as tests and grading periods come to a close. Summer is a time to be carefree. More often than not, we adults tend to get caught up in little things that really don’t matter, or big things we can’t change. Children especially, should not be burdened with worries beyond their control. This tradition is a great way for all of us to learn to let go of what troubles us and enjoy the precious time we have together, especially if you have some worriers in the bunch. Yes, it’s a little corny, but it’s a great visual to help the children process. On the last day of school, or as you are preparing to take off for the family’s summer vacation, have everyone write down something that worries them. Whatever it is that bothers us, once it is down on paper, it’s easier to let go. To celebrate this, roll up your “worries” and tie them with a ribbon. Have everyone toss their worries over their shoulder, bury them or throw them away. Declare that you are not going to let those worries get in the way of embracing the moment. Your swimming pool, a local fountain or the bathtub are all great places to “let go” and begin your carefree summer. For our family, we commit those worries to the Lord, because we know He understands them better than any of us. 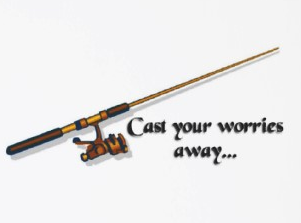 I don’t care how silly it sounds, anything you can do to cast those worries at the feet of Jesus works for me. There may never be a more practical life lesson for us all to heed. I, for one, needed this reminder. Great idea! I’m going to try this on my little worrier! What a neat idea! We’re two days in, and actually just back from the beach. . . but I’m going to mention this the next time we’re there! Thank you! What a great tradition for kids and adults! I love the visual impact of it. The instant peace that comes when we relax, let go. and turn our stress, worries, and anxiety over to the Lord is amazing! Being thankful for these things draws us closer to Him so we can truly be still and know that He is God! I love your blog and I look forward to each new post.